there comes a time when a girl always finds herself on websites where they only wish they could afford the garments on offer. along with net-a-porter, avenue32 is a firm favourite of mine to do this. i know this kind of wishlist won't be to everyones taste as let's be serious who could afford garments like this on a regular basis? not me that's for sure; but even so for those a little more interested in new collections by designers this is for you. 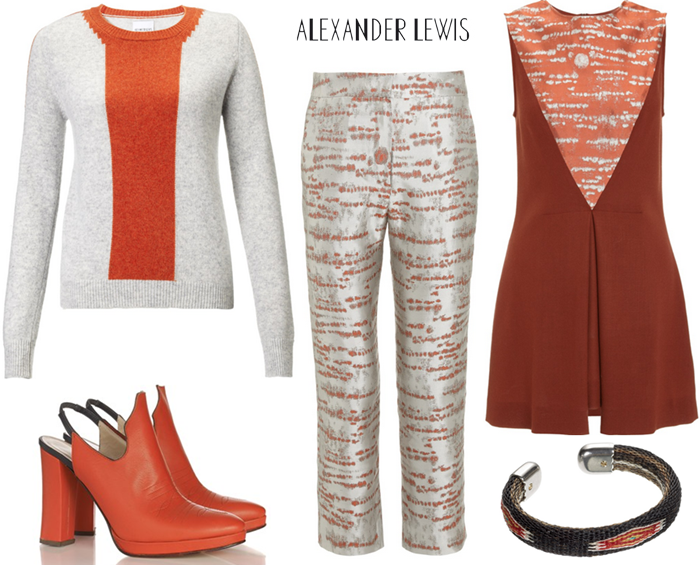 i've never really heard of alexander lewis before discovering the new A/W collection online and now i actually want everything. rust orange is such a beautiful autumnal colour, and i never would have imagined how amazingly well it would go with metallic silver. both the dress and trousers i could imagine becoming staple pieces in my wardrobe (metaphorically speaking of course), ah if only! after seeing this collection i'm now on the hunt for a way to introduce rust orange pieces into my wardrobe on a much more affordable scale via the highstreet. but my heart will always be with these original pieces. so beautiful... what do you think? Wow, those shoes are calling my name. Love this collection. The colors are perfect for Fall!